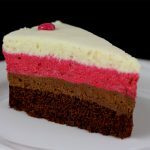 Vegan, gluten-free, soy-free, nut-free Chocolate Raspberry Mousse Cake with raspberry, dark and white chocolate mousse made with aquafaba. The most delicious chocolate mousse cake I’ve ever tried :). Another great recipe with aquafaba. 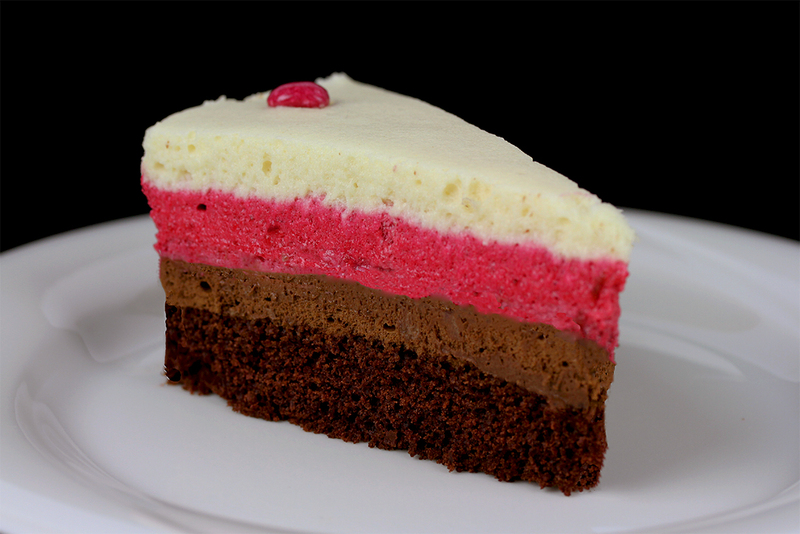 Relatively similar to my Mousse au Chocolat Cake, but with the addition of a raspberry mousse layer – so even more delicious :). I really love to make all kinds of mousses with aquafaba. 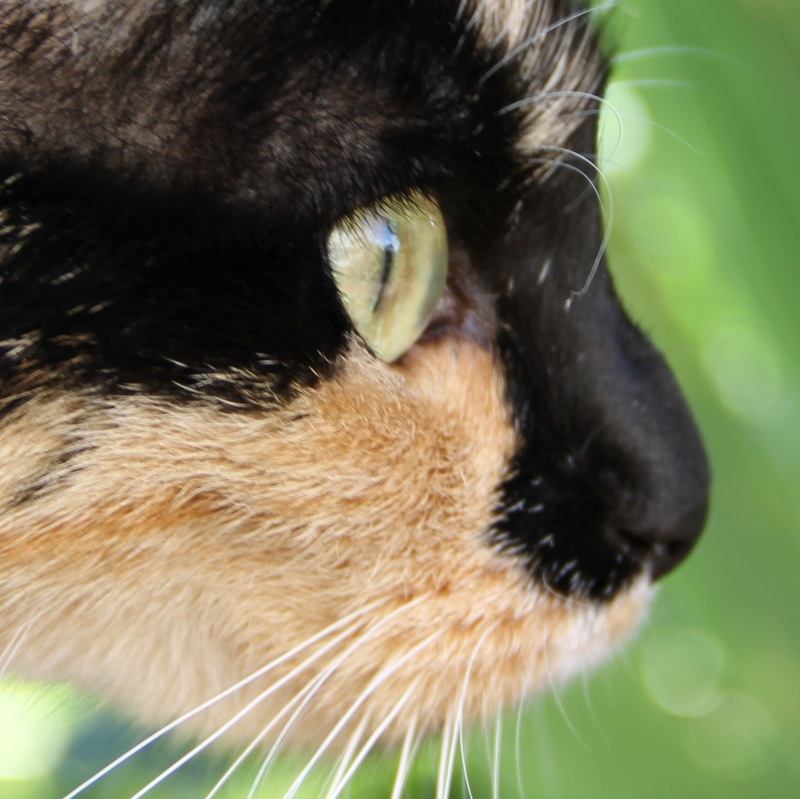 The layers are relatively firm, but still very light and soft. 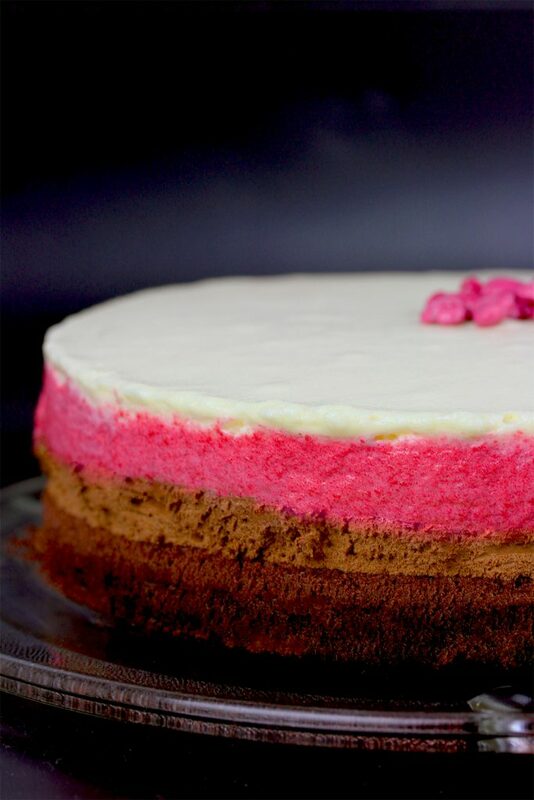 This Chocolate Raspberry Mousse Cake is a very delicious, special cake for special occasions (and for making not so special occasions very special ;)). For the base I used 50 g millet flour, 50 g tapioca starch, 1/2 tsp of guar gum. You may also use rice flour and potato starch or any gluten-free all-purpose flour. In total, you will need the liquid from two cans of chickpeas for this recipe (divided between the different layers). For the raspberry layer you might adjust the amount of sugar, depending on the sweetness of your raspberries. I used frozen raspberries, but fresh should be even better in this recipe, I guess. It takes some time to cool each layer, before the next layer can be made, so plan ahead. Overall, it doesn’t take too long to make the individual layers, so the cake is relatively easy to make. Can’t wait to try this recipe with cherries or strawberries instead of raspberries :). Preheat oven to 350°F (180°C) and grease a 9 inch (24 cm) springform pan. Mix flour, sugar, baking powder and cacao in a large mixing bowl. Add water and oil and beat the mixture until smooth. Pour the mixture in the prepared pan and bake for about 20 minutes until a toothpick comes out clean. Melt the dark chocolate and set aside. Whisk up the aquafaba with an electric hand whisk until peaks form. Then slowly add xanthan and sugar whilst mixing. Gently fold in the molten chocolate (be sure the chocolate is not hot anymore) and stir very gently with a spatula until combined. Line the inner wall of the springform pan with aluminium foil or waxed paper such that it extends over the pan's sides. Spoon the mousse in the springform pan over the cooled cake and place it in the fridge for about 30 minutes for the mousse to set. Puree raspberries in a food processor and strain the juice into a small pot, pressing the pulp. Mix agar powder with water and add it to the raspberry juice. Bring the juice to a boil and simmer for about 7 minutes, until reduced by half. Add sugar to taste and let cool a bit (not too much, as you don't want it to become too firm). Gently fold in the cooled raspberry mixture and stir very gently with a spatula until combined. Melt the white chocolate and set aside. Gently fold in the molten chocolate and stir very gently with a spatula until combined. Spoon the mixture into springform pan over the raspberry mousse and refrigerate for about 1 hour. When set, run a thin knife between cake and side of springform pan and remove the side of the pan. *For the flour mixture I used 50 g millet flour, 50 g tapioca starch and 1 tsp guar gum.